For < 96 samples, follow the protocol in Section 1.1A. For 96 samples, follow the protocol in Section 1.1B. Note: We recommend using a PCR work-up rack such as the TruSeq Index Plate Fixture (Illumina #FC-130-1005) to assist in properly combining the index primers during the PCR amplification step. Alternatively, 96-well deep well plates can be used and aligned against a PCR plate as in the diagram below. 1.1A.1. Ensure that a valid combination of i7 and i5 primers is used. See Appendix A to verify that correct primer combinations have been selected. Arrange the (orange) i7 primers in increasing order horizontally, so that the lowest number i7 index primer is in column 1, second lowest number i7 index primer is in column 2, etc. Arrange the (white) i5 primers in increasing order vertically, so that the lowest number i5 index primer is in row A, second lowest number i5 index primer is in row B, etc. Record their positions on the PCR setup template (see Appendix B). 1.1A.3. Using a multichannel pipette, add desired volume of (white) i5 primers to every column (as needed) of the PCR plate. It is critical to change tips between columns to avoid cross-contamination. 1.1A.5. 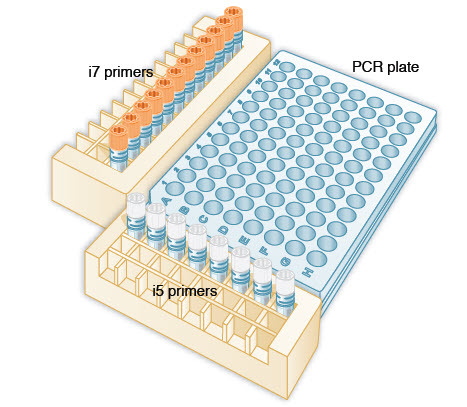 Using a multichannel pipette, add desired volume of (orange) i7 primers to every row (as needed) of the PCR plate. It is critical to change tips between rows to avoid cross-contamination. 1.1A.6. Discard the original i7 orange caps and apply new caps to avoid index cross-contamination. 1.1A.7. Add 25 μl (blue) NEBNext PCR Master Mix to each well that contains primers. 1.1A.8. Add desired volume of adaptor ligated DNA for a final volume of 50 µl to the corresponding well. Gently pipette up and down 5–10 times to mix. It is critical to change tips between samples to avoid cross-contamination. Record each sample position on the PCR setup template (see Appendix B). 1.1A.9. Cover the plate with Bio-Rad Microseal "A" Film, and seal with a rubber roller. Quickly centrifuge. 1.1A.10. Perform PCR according to recommended cycling conditions. Arrange (orange) i7 primers in increasing order horizontally, so that i701 is in column 1, i702 is in column 2, i703 is in column 3, etc. Arrange the (white) i5 primers in increasing order vertically, so that i501 is in row A, i502 is in row B, i503 is in row C, etc. Record their positions on the PCR setup template (see Appendix B of the manual). 1.1B.2. Using a multichannel pipette, add desired volume of (white) i5 primers to every column of the PCR plate. It is critical to changetips between columns to avoid cross-contamination. 1.1B.3. Discard the original i5 white caps and apply new caps to avoid index cross-contamination. 1.1B.4. 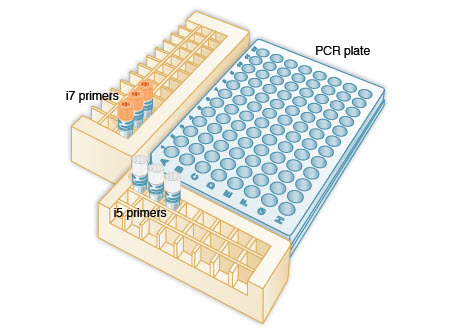 Using a multichannel pipette, add desired volume of (orange) i7 primers to every row of the PCR plate. It is critical to change tips between rows to avoid cross-contamination. 1.1B.5. Discard the original i7 orange caps and apply new caps to avoid index cross-contamination. 1.1B.6. Add 25 μl (blue) NEBNext PCR Master Mix to each well. 1.1B.7. Add desired volume of adaptor ligated DNA for a final volume of 50 µl to the corresponding well. Gently pipette up and down 5–10 times to mix. It is critical to change tips between samples to avoid cross-contamination. Record each sample position on the PCR setup template (see Appendix B). 1.1B.8. Cover the plate with Bio-Rad Microseal "A" Film, and seal with a rubber roller. Quickly centrifuge. 1.1B.9. Perform PCR according to recommended cycling conditions. 4 (i7) * 3 (i5) From the i7 primers, choose a valid set of 4. From the i5 primers choose a valid set of 3. Use each i7 primer with each i5 primer to form 12 primer pairs for PCR amplification of 12 libraries. When setting up the sequencing run, select “Dual Index” and choose the indices used for each sample. 3 (i7) * 4 (i5) From the i7 primers, choose a valid set of 3. From the i5 primers choose a valid set of 4. Use each i7 primer with each i5 primer to form 12 primer pairs for PCR amplification of 12 libraries. When setting up the sequencing run, select “Dual Index” and choose the indices used for each sample. 6 (i7) * 2 (i5) From the i7 primers, choose a valid set of 4 and add any other two i7 primers, for a total of 6 primers. From the i5 primers choose a valid set of 2. Use each i7 primer with each i5 primer to form 12 primer pairs for PCR amplification of 12 libraries. When setting up the sequencing run, select “Dual Index” and choose the indices used for each sample. Option 4: 12 (i7)* 1 (i5) Use all 12 i7 primers. Use any i5 primer. Use each i7 primer with the i5 primer to form 12 primer pairs for PCR amplification of 12 libraries. When setting up the sequencing run, select “Single Index”, and choose the i7 index used for each sample. 6 (i7) * 4 (i5) + 2 (i5) From the i7 primers, choose a valid set of 4 and add any other two i7 primers, for a total of 6 primers. From the i5 primers choose a valid set of 4 and add any other two i5 primers, for a total of 6 primers. Use each i7 primer with four of the i5 primers to form 24 primer pairs. Use any of the six i7 primers with the remaining two i5 primers to form 2 primer pairs. This will give you a total of 26 primer pairs for PCR amplification of 26 libraries. When setting up the sequencing run, select “Dual Index” and choose the indices used for each sample. 6 (i7) * 5 (i5) From the i7 primers, choose a valid set of 4 and add any other two i7 primers, for a total of 6 primers. From the i5 primers choose a valid set of 4 and add any other one i5 primer. Use each i7 primer with each i5 primer to form 30 primer pairs for PCR amplification. Use 26 of the 30 primer pairs to amplify 26 libraries. When setting up the sequencing run, select “Dual Index” and choose the indices used for each sample. Illumina uses a red laser/LED to sequence A/C and a green laser/LED to sequence G/T. For each cycle, both the red and the green channel need to be read to ensure proper image registration (i.e. A or C must be in each cycle, and G or T must be in each cycle). If this color balance is not maintained, sequencing the index read could fail. The following table lists some valid combinations that can be sequenced together. Note: for 1-plex (no pooling), use any i7 primer with any i5 primer. In this case it is important to select “0” index reads in the Illumina Experiment Manager. CAUTION: Sufficient primers are provided to generate 96 different samples if each i5 primer is used only once with each i7 primer. If using subsets of i5 and i7 primers multiple times, you may have to readjust primer pairs to be able to generate 96 samples. Table 2.1. Pooling: 2–12 libraries; Sequencing Workflow: Single Index (Select "1" Index Reads in the Illumina Experiment Manager).